Len Lamensdorf’s thrilling retelling of the life of Jesus of Nazareth. Did Jesus believe he was the son of God? Did he claim to be the Messiah? Did Jesus consider himself to be divine? The Murdered Messiah unravels these riddles and reveals the true nature of this remarkable man, with reverence for his extraordinary sacrifice and his passionate love for God”. He is tall, dark and handsome, an excellent marksman and skilled jet pilot, so what is he doing, working for a beautiful, Oscar-winning film actress as a gardener? He seems like so many other Mexican and Central Americans, toiling in the yards and gardens of Californians. But there is a dramatic difference: Jose is actually a world-class scientist, hiding from a murder-ous drug cartel, planning to unleash a vicious chemical attack against the hated Anglos, and restore the fabled “Aztlan Empire” in the southwestern United States. Jose is a member of a secret clique of distinguished scientists working undercover to thwart this terrible conspiracy, but time is growing short and there are many unsuspected enemies. "The Mexican Gardener is a true thriller - a pulse pounding, suspense-filled read!" READ CHAPTER ONE FREE!, CLICK HERE! Billy Lee, an African-American slave, was at George Washington’s side for over thirty years. Though never a relationship between equals, it was an intimate and enduring connection. A superb horseman, bold soldier and a literate aide, Billy Lee stood next to Washington when he crossed the Delaware, galloped at Washington’s side in battle—a slave armed with a pistol, carbine and spyglass—served with him in Valley Forge and through the difficult years to the final victory at Yorktown. He was responsible for Washington’s public and private papers at conventions and congresses, but Billy was a slave, always hoping to be freed, and his slavery cost him the love of his life. Yet his loyalty to Washington was unwavering. This unique and remarkable “buddy” story delves into the quest for freedom, from the tyranny of England to the chains of slavery. A novel, adapted from Len Lamensdorf’s play, The Ballad of Billy Lee. READ CHAPTER ONE FREE. CLICK HERE!
" 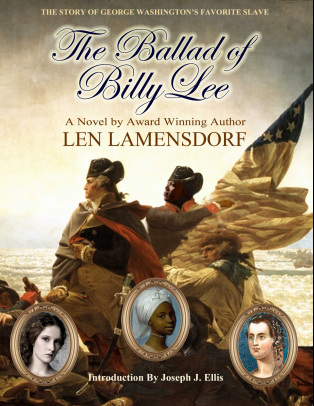 Rooted firmly in the historical record, Len Lamensdorfʻs "The Ballad of Billy Lee: The Story of George Washingtonʻs Favorite Slave" imagines a full-blown memoir by a man who would otherwise be a faded footnote in American Hisotry. In The Ballad of Billy Lee, Mr. Lamensdorf celebrates the life of one of the most fascinating minor characters of American history. History buffs should thoroughly enjoy this work, but so should anyone who enjoys a great story.... Lamensdorfʻs true stroke of genius is in the way he weaves what little documentation that does exist into a colorful -- and entirely plausible -- tapestry. The liberties he takes are calculated, artful and true to actual events." Click Here for Links to Videos and Other Media relevant to The Ballad of Billy Lee, The Story of George Washingtonʻs Favorite Slave.